*cries a bit* I really wish they'd stop ignoring your great ideas. If you ever ever ever get in touch with NECA and find out what's up with them seriously try and work on getting this idea made. Why was the original Honeycutt initially 'Gold ' ..
Guessin' that was Playmates doing. The logic of Gold Fugitoid was odd, But he did look cool for what he was worth. He was also smiling in some of the earliest prototypes for the first fig. This is a really cool toy. 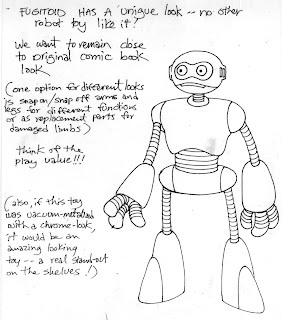 I really enjoy the notes on the design, its a little look into what one does when making a sales pitch. Very cool. 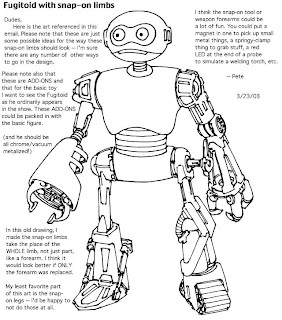 In 2003, I think it helped that the Fugitoid was an actual part of the show for awhile. Before I found the old '80s comics back in '96 (I was about 12), the only thing I knew the Fugitoid from was that he was an enemy robot that I had to fight more than a few of in the later stages of TMNT3 on the NES. Also, speaking of comic-based figures, any word on NECA? I'm glad there isn't much vac-metalizing on TMNT figures. While the effects can look cool, in time it often chips away and peels off. Shiny pearly plastic is much better. Somewhere amongst the archives of clutter at my mom's house, I have a piece of paper I drew on and told her to mail to Playmates (obviously she didn't) in which I drew a crude Fugitoid drawing and wrote something along the lines of "please make more Fugitoids", because he was my favorite uclocatable figure on the cardback. It has to be amongst my first ever TMNT drawings, will definitely scan and share if I can find it over the holidays, it is certainly worth a laugh. Also a good case study to prove that children are suckers for robots, I carried around my first Fugitoid figure till his incorrect gold paint was half worn off. I had robot Rocksteady in the basement a few years back. While it DID look cool that way, most of it was torn off :(. I'd love to see a 7" Vacuum metalized Shredder from NECA based on the old toon. Maybe a statue would last longer? I guess none of my Vac-Metal figures chipped or flaked off because I display them and don't play with them. Some figures just need to have this done to them because while many of us are great at doing custom figures this is just one thing we can not do on our own. And while you have a big company working on your line it's something I'd think you'd really fight for knowing how hard it is to do. It's just not some every day simple process. -->> die-cast ' Fugitoid ' .. I love both the 2K3 and vintage Fugitoid. I actually REALLY like the vintage one for some reason. It doesn't really make me think of Fugitoid.. But it makes me think of a very cool robot. Shame neither ever got Vac-ed, considered some of the poor choices for figures that did. So instead of the original Shredder being vacuumized, we were treated to the start of Playmates' long fetish with blue-armoured Shredder. Well, there is now a vac-metal Fugitoid action figure.